I was watching our television news tonight, and was amazed to see this footage of Ambam, a bachelor Western Lowland gorilla at Port Lympne Wild Animal Park in Kent, England who apparently loves to walk around like this. My first reaction was to wonder if it was a man dressed in a very lifelike gorilla suit, and it brought to mind a prank delivered by Australian comedians Hamish and Andy. Take a look at their very funny effort at the Werribee Open Range Zoo. The kids are back at school next week, just as the hot weather arrives. I’m guessing our air conditioned library just might be the destination of choice on their first day back next year! If you’re in Melbourne, stay cool this weekend. Chill out, literally! Well, that’s what we hope we’ve done. Created a Library for the future, that is. When we started planning Toorak College’s new Norman Carson Library, we knew this would be a space that had to meet the needs of a school population into a future that will see a physical collection change as society becomes increasingly comfortable with digital storage and usage. The space needed to be flexible and able to accomodate our book collection, but we didn’t want the books to be the predominant feature. We realise that fiction will be with us for some time, but our non fiction collection we see as a shrinking collection. We needed to find a way to make it inviting, but able to be transformed with changing times. You get one shot to get things right. Our students return next week, and we can’t wait to see their reaction to the space. It will be their usage of the spaces that will let us know if we’ve hit the mark. I thought I’d share some pictures here to demonstrate the thinking behind the design. The non fiction shelving in our large learning commons space. 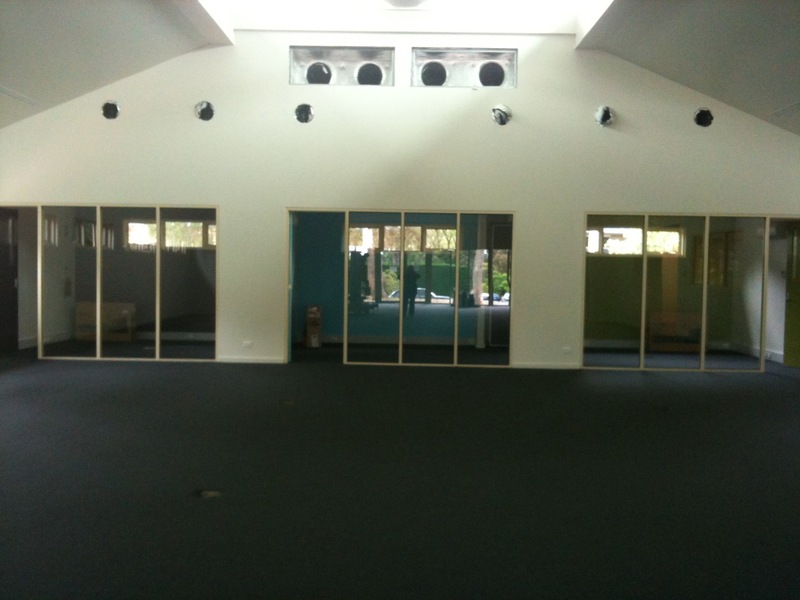 We wanted to utilise the wall as much as possible so that we could hopefully accomodate two classes in this space. We will have to see if it is possible once our furniture arrives. There are three break out rooms at the back of the learning commons space. 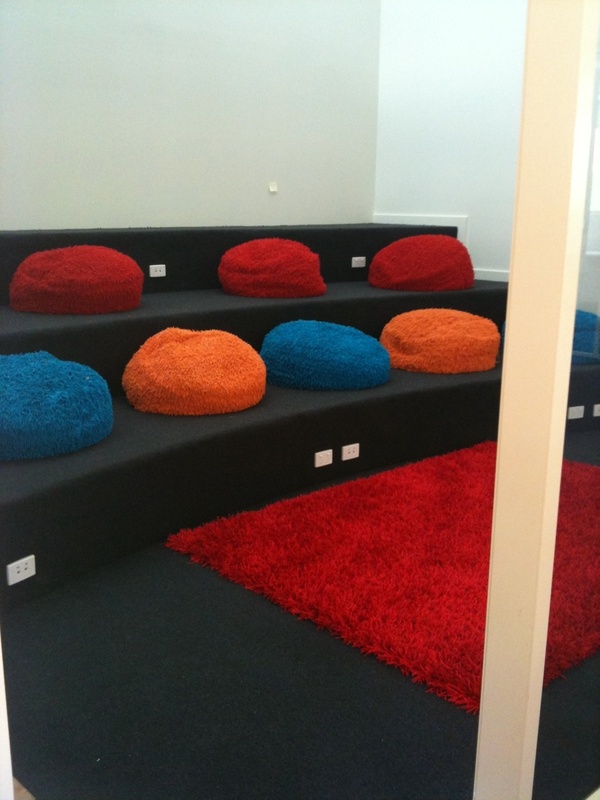 We see these as small group work spaces, meeting spaces and private study areas. Each room has it’s own LCD TV to be used for presentations by students and staff. A divider separates two rooms so that we can create a larger space for a small class if necessary. This is the large conference/work/relax space at the front of the learning commons area. 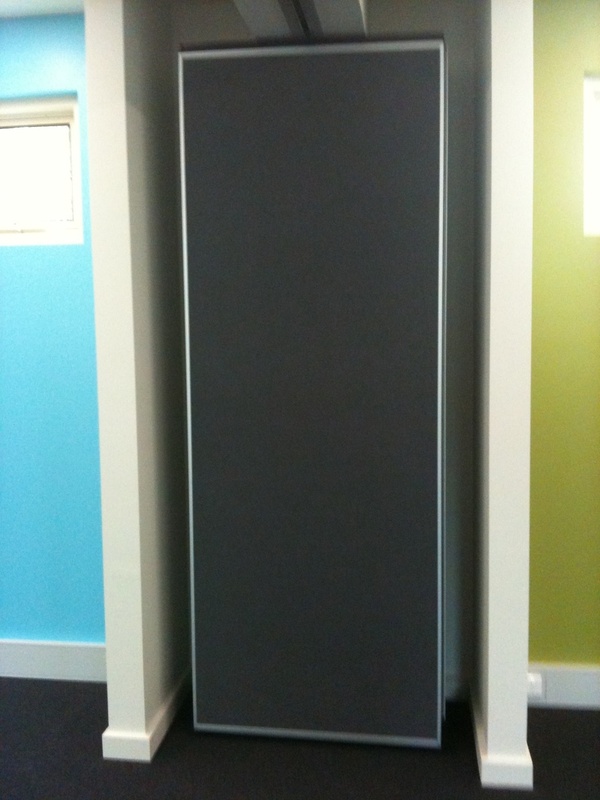 This room has a large divider (see below) that can provide us with a large room for Year level presentations. It has a projector and very large screen for this purpose. (see below) We aim to provide flexible furnishings in this space that can allow for it to be transformed for different purposes. This vista of this space is simply beautiful. It looks out to our Edna Walling designed gardens and historic Hamilton Building. 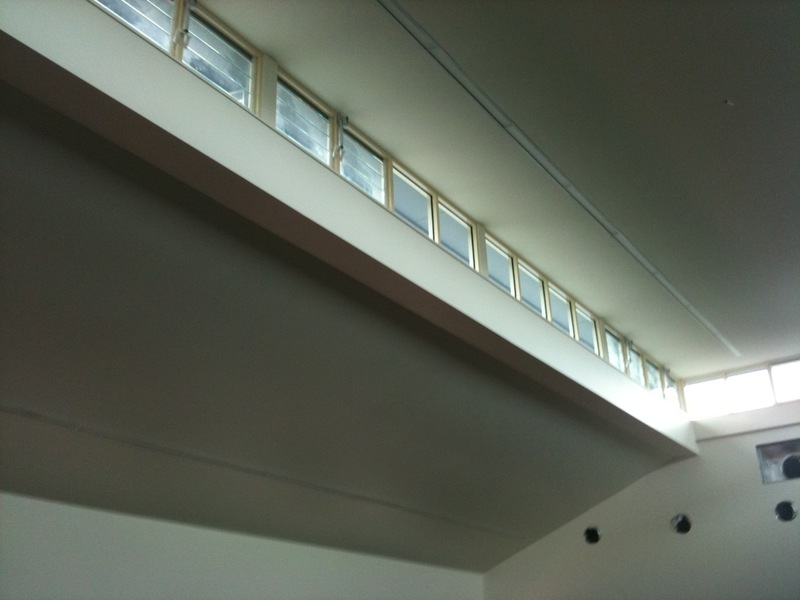 High pitched ceilings give the library a feeling of additional space, and louvre windows will help with the release of heat when the air conditioning is not being used. 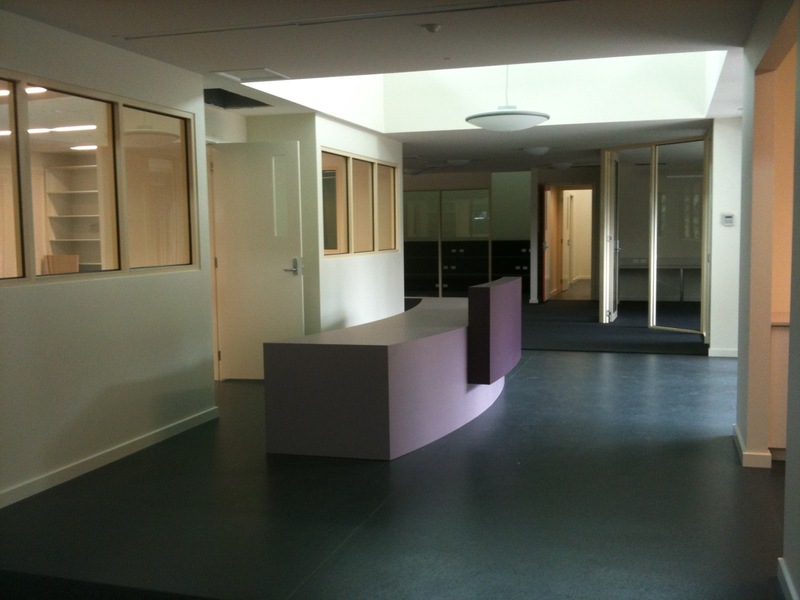 Here is the circulation desk, opposite the entrance, with the library workroom behind. It divides the two spaces of the library and allows for visibility to the learning commons space and the reading and multimedia spaces. 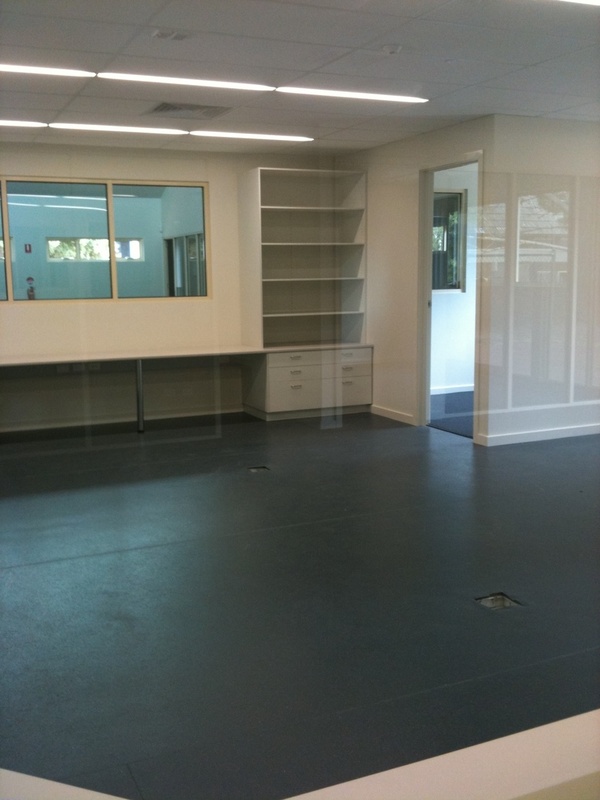 The library workroom is centrally located, with windows all around giving visibility to all areas. 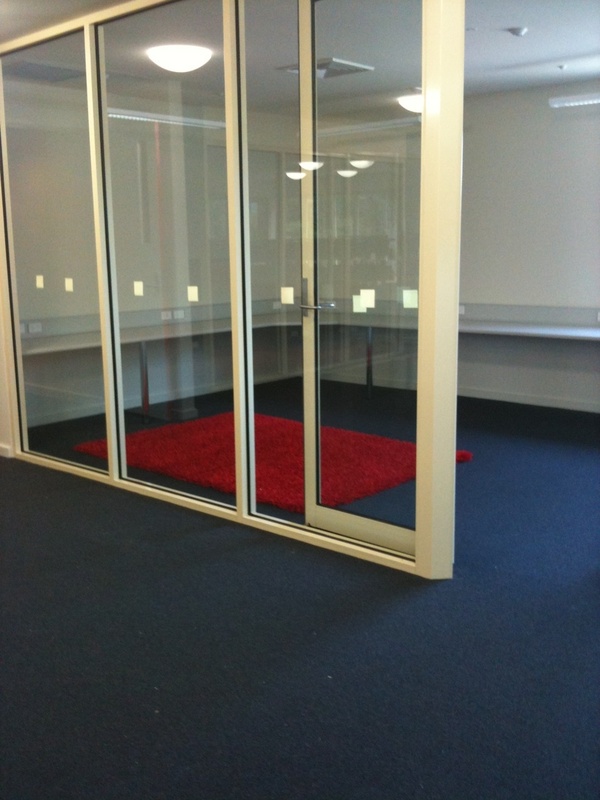 This is our Multimedia room, that will be fitted out with Mac desktops. It adjoins our fiction/reading spaces. This is our Fiction collection, looking out to our reading space. We are going to replace a standing double bay with wall shelving to help us maximise space. Our reading space. We intend to make this an L Shaped space, once we have the wall shelving in place. 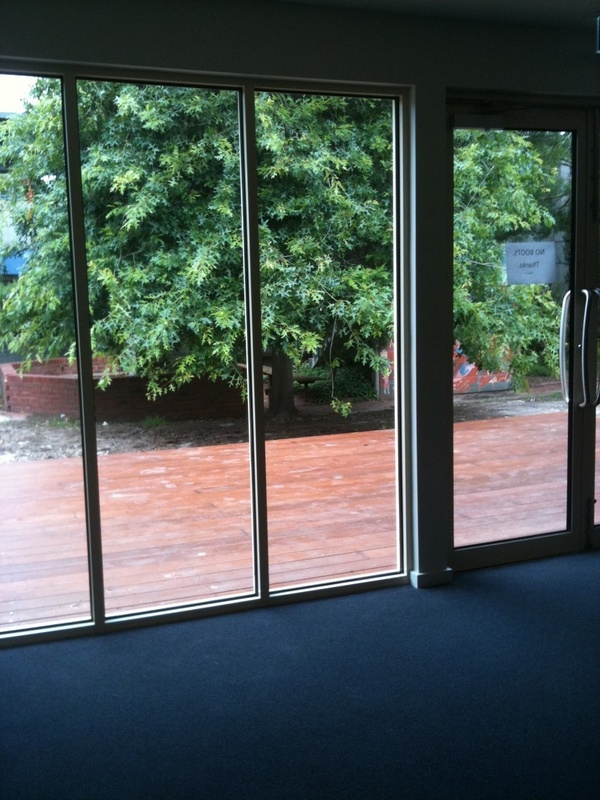 Opening doors at the rear of the reading space open to this deck, making this an indoor/outdoor reading space. The tree behind has had its canopy trimmed since this photo was taken, and it looks even more picturesque. 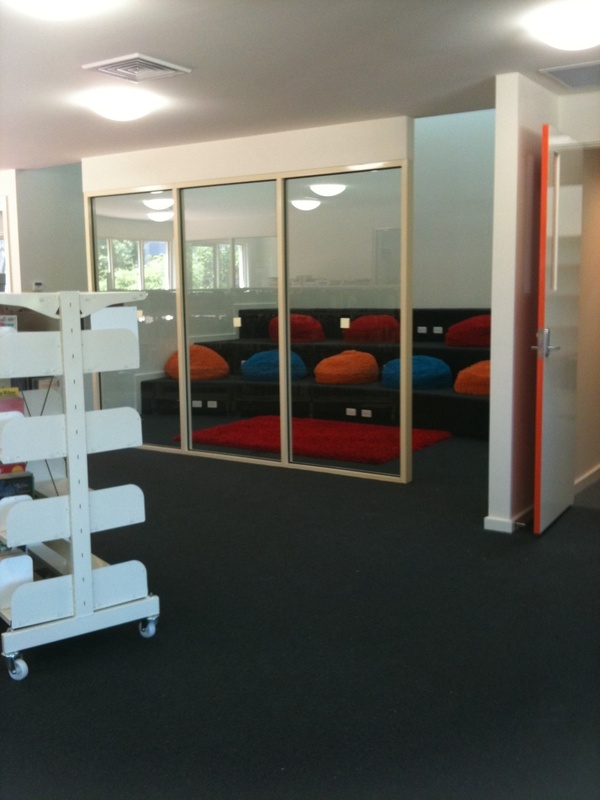 This tiered room, for chillin’ out and relaxing, or for presentations to groups, adjoins our fiction/reading space. It’s my favourite room, and has a very high ceiling giving it an interesting acoustic quality. 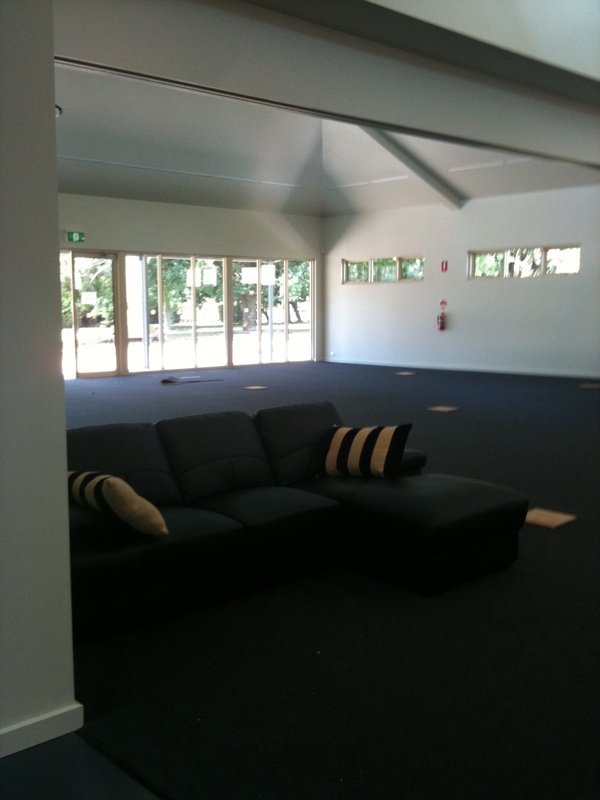 It is so exciting having the opportunity to help plan and realise a new learning space for students. Like I said, the proof of its effectiveness will lie with student usage. Seeing their reaction to this space when they return next Monday will be something to savour I’m sure. There are floorboxes with data and power dotted throughout the space for our power needs (we are a laptop school), and we will have netbooks and iPads available for student use when their own devices are not with them. Our next step is furniture, and this is exciting too. February will see the first installment with more to come in a second stage. Flip tables are being used, as are ottamans, colourful chairs and what we are calling a snake lounge, and that will be the signature piece of the Library space. Hopefully this will be a space that will meet our students needs well into the future. We wanted it to be welcoming, and it certainly has a homely feel when you enter it. It has been enthusiastically embraced by staff, and I expect to see the same reaction from our students, maybe an even more effusive one. I’ll let you know how it’s received. This is my application video for the Google Teacher Academy being held in Sydney in April 2011. I originally had another idea, but it involved a humorous jab at Steve Jobs and the Apple Distinguished Educator’s program, and with the recent news about Steve standing down as CEO of Apple due to ill health, I thought it would be in poor form. So, this is what I came up with instead. I have no idea if it’s got any chance of helping me gain a guernsey to what I’m sure will be an outstanding day, but it was fun putting it together anyway. It was filmed in our brand new school library at Toorak College, and you’ll notice the lack of furniture in the background shots. Steve, a colleague from school, helped me with the filming, and we shared a few laughs as I made attempts to get my part down in one take. Hence the out-take at the end of the video! The click sound was added to Freesound by TicTacShutUp and is licensed under a Creative Commons Sampling Plus 1.0 License. Chris Betcher, Tania Sheko and Phil Hogg are a few of the many teachers who have created really interesting videos in the hope of becoming a Google Certified Teacher. Take a look at their efforts. It’s the first time Google have offered this outside of the United States, and they are seeking applicants from a variety of nations – and applicants with international teaching experience. There are only 50 places – a fierce competition is no doubt unfolding amongst all those applications Google are receiving. I’ve just scraped in in terms of my application, as it closes on January 27th. Successful applicants will hear the good news towards the end of February. Improveverywhere have posted their 2011 No Pants Subway ride, an event that has grown in size and stature over the last 10 years, and saw participation from people in 50 cities globally this year. I loved the view of Union Square at the end of this video. It brought back happy memories of my time in New York last year, when Union Square was the closest Subway station as I made my way to the many magnificent sights that make up that wonderful city. In fact, it was exactly this date last year that my plane landed at JFK airport in New York. I’d love to make a return visit one day – sooner rather than later I’d hope. Who knows? Sometimes the things you wish for do come true! In the meantime, I’ve been unbelievably busy this week back at work getting the new library at my school organised for the school year. We took possession of the building on Monday, and I’ve been there every day, except for Tuesday when my time was punctuated with a bout of Gastroenteristis! Just what I needed- NOT! Today was huge. All of the books were stacked on the new shelving and everything, office supplies, digital equipment, the small amount of furnishings we are bringing over with us, were placed in the building. We had specialist removalists helping thank goodness, or there’s no way I’d be typing this now. In fact, it’s pretty surprising I’m doing this at all, because I am thoroughly exhausted. Time for bed methinks. I’ll see if I can get a post happening where I include some pics of the building. In the meantime, here’s my favourite space at the moment. 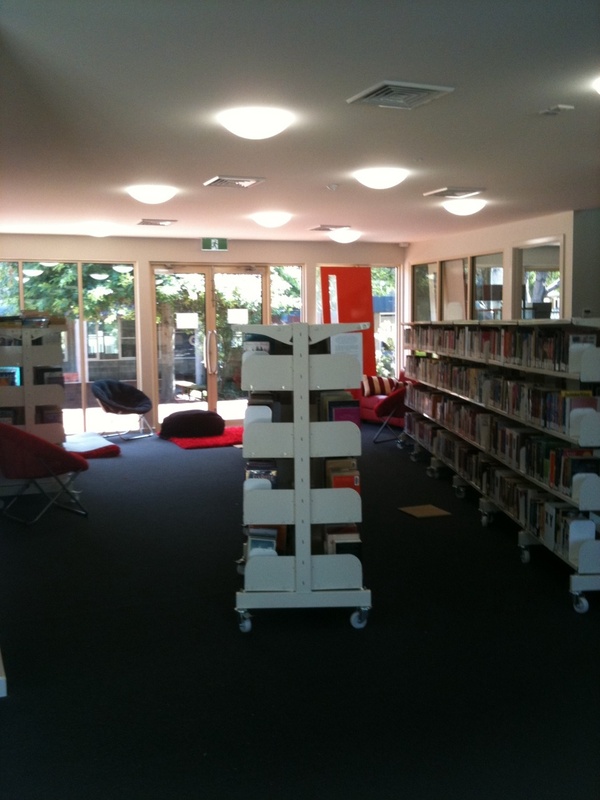 Reinventing our Library space – what did we do? Tomorrow, I return to work. It’s an early start for me, and that’s because the new library that has been under construction is completed. It’s very exciting and something I have alluded to over the last year. 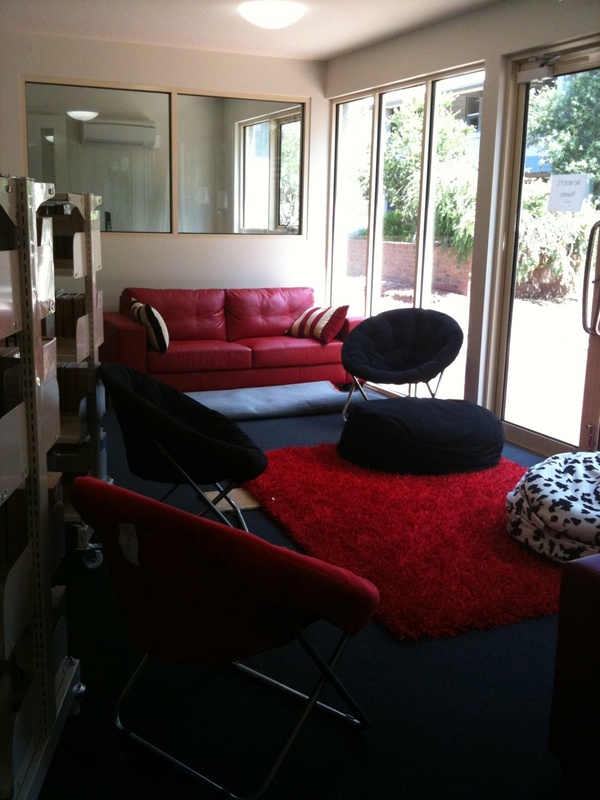 Our library, and the staff who work in it, have been located in temporary accommodation for the past twelve months so we are very much looking forward to moving into a spacious environment where we can realise some initiatives we have planned for the 2011 school year. I haven’t written a post outlining the process we underwent planning this construction, and I thought it might be useful for anyone facing either remodeling or building from the ground up. 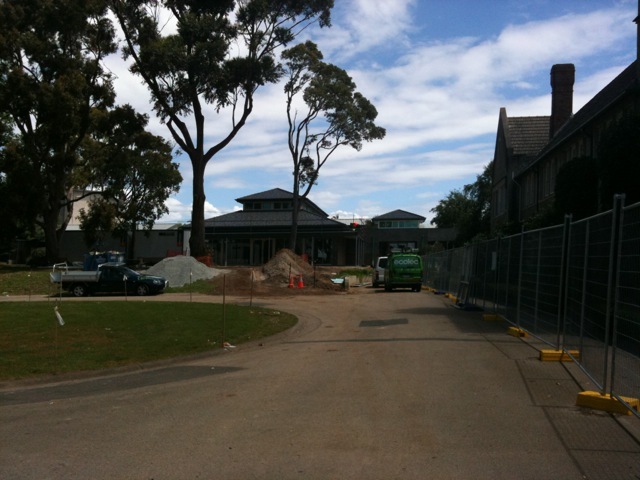 Our original brief was to remodel an existing building, but the eventual outcome was the demolition of our old library, and the construction of a new building on the same site. We had very little time in the planning stages to come up with a design, but after working in a library that had functional issues, I was already convinced of the changes we needed to implement to make for a more functional space that would meet the needs of our learners, and the people who work in the building. 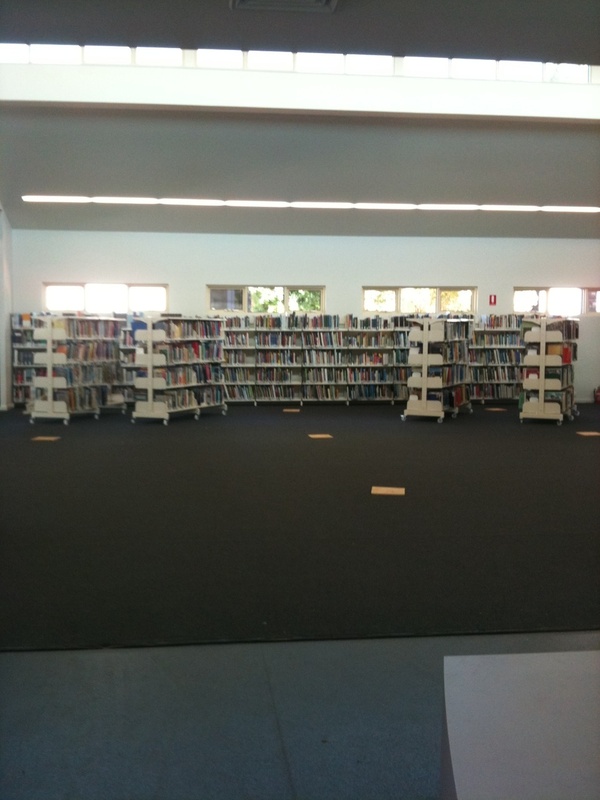 Our old library had already seen a change in usage as a result of changing seating options. Over a two year period we invested funds into couches and cushions, and we strategically placed them in and around traditional table and chair configurations. What we saw was an almost gravitational pull towards the new seating options. Classes that were booked in would float to those spaces rather than the traditional areas. At recess and lunch breaks those spaces were fully occupied with students working on their laptops, reading and talking. We also had become more flexible about eating arrangements. I know this will not suit many, but we allowed our students to eat in the library, provided they were respectful and cleaned up after themselves. I have always struggled with break periods like lunchtime, and restricting student use of the library until they have finished lunch. For many students, the library is a refuge, the one space in the school that is always supervised and can provide them with a place to belong. Those kids need the library, and eating lunch by yourself can be a very solitary pursuit. At least in the library they are in a group atmosphere. I think it helps them. I’m not sure how we will approach eating in this new space. My feeling is that we will be very precious about it to start with, and probably will ask students to eat before they come in, but I feel we will need to gauge this and see how our ‘refuge’ students react. We had always struggled with poor design that meant our workroom was located well away from the main traffic areas. It led to a dislocation of staff and an inability for some staff to see when times were busy and more hands were needed on deck. We made sure in our new design that our workroom was centrally located with visibility to all parts of the library. The reality of any library is that we are service providers in our school; students and staff needs come before all else, and we need to be responsive. I’ve included a floorplan of the new library below. I used an online program called Floorplanner to help me insert furniture, and I used Jing for the annotations. The furniture is not necessarily as it will appear in the new space and there may well not be all of it either. It will very much depend on what the space looks like when we walk into it! The picture below was my thinking based on what we envisaged might be possible. We have tried to put most of our non-fiction shelving along a wall, so that it doesn’t compromise what could be a learning space, but we have found that we will have to have some shelving spreading into a learning space. The ‘snake lounge’ as I’ve called it, is actually a very large piece of furniture that will be the defining piece of the large library space. I can’t wait until it’s installed- it’s going to be a stand out piece. It won’t be in until mid Feb at this stage. I’m excited about the portable IWBs that we will have in the space (there will be three of them) because we intend to allow student use of these. I’m interested to see what use they make of them. Right throughout the flooring are floorboxes containing data and power for students to power up devices. This was a crucial part of the design process- there are not many desktop computers- they exist only in the multimedia lab. Our students bring their own laptops to school and we provide netbooks (and iPads as of this year) for student use within the library if their device is not working.We are a wireless networked environment, but we have factored data points for cabled connection into the floorboxes for moments when the wireless may be down. Another exciting addition is the presentation space. It’s a room off the fiction/reading /relaxation space that has three rows of tiered seating – a reverse amphitheatre type arrangement. All of the tiers have power outlets within them, so that our students can lounge there and plug their devices in when necessary. We envisage teachers will book this space for presentations and will be using one of the portable IWBs that can be rolled in to allow students to hook up their computers. The conference room at the front of the very large learning commons type space is exciting too. 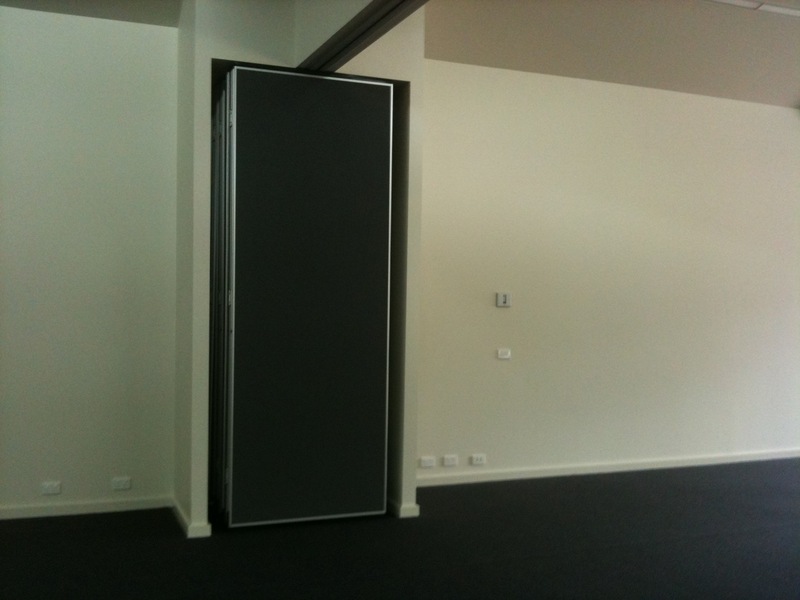 It has doors that can be remotely closed making it a self contained space. 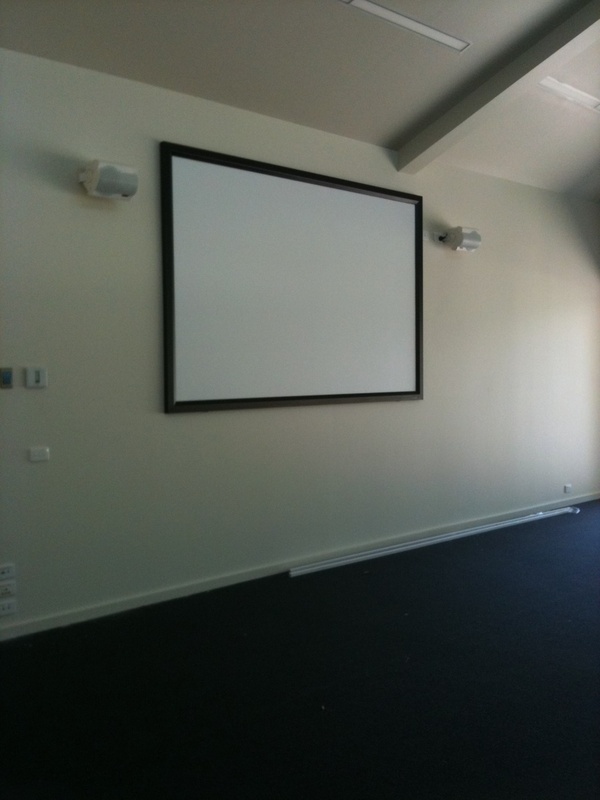 It will have a data projector and very large screen installed for presentations. If your school is anything like mine, you will know how hard it can be to facilitate large groups like a year level for a presentation. We think this room is going to see a lot of traffic, and we are planning flexible seating arrangements so that it can be reconfigured to meet changing needs quickly. We will be sharing the space with our IT Department and this will be located in the back of the building. Both the library and IT department welcome this. We work very closely together facilitating technology needs of our students, and a closer physical working arrangement is going to be an added bonus. We won’t have all of our furniture installed from the start of the school year. It will be a partial fit out to start with but we envisage the place to be totally functional from May. It’s going to be a bit messy and very busy for the start of the year, but it’s going to be exciting too. I’ll post some pictures of the completed building in the coming days. This animation from Guy Collins made me smile. Do you ever have to hold your tongue as you watch people search the net? I know that I’ve spent time with students explaining how to use quotation marks around phrases and other tips and tricks related to search, and I see them ignore everything I’ve said and do it their way regardless! Doesn’t mean I won’t stop trying. It’s my job to persevere and repeat myself over and over. : ) I just have to keep a smile on my face and not get exasperated like the comic figure above. I’ve just followed a link in the back of my blog to Jo McLeay‘s ‘The Open Classroom‘. Her post today called, ‘What makes an effective blog post, or how to write so readers want to read‘, describes my blog as”an oldie but a goodie”. It fills me with much joy to have my blog described this way. This week marked the three year anniversary of this blog. I started writing on January the 12th 2008. It actually slipped my notice until today, and Jo’s post prompted me to mention it here. So much has happened in that three year span, and the core of it all has been the sharing that takes place in this small corner of the Web. Writing is important to me; I think I’ve got better at it, and even when I write a post that I think is good, but gets no obvious feedback (take this week’s Our Ephemeral Web as a case in point! ), there is satisfaction in knowing I’ve stuck my neck out and said what I thought needed saying. It may sound corny, but writing like this makes you feel stronger somehow, a little more armed to face the world and the critics out there. It does for me anyway. But, there are bigger and more important things than this blog. Australia, and Queensland in particular, have seen some extreme weather conditions this week and there are people hurting in my country. My heart goes out to them. It goes out for the people in Brazil as well, who are also struggling with heartache due to floods and landslides. Our world certainly presents some of us with challenges that seem unfairly distributed. What has been encouraging today, in Australia at least, is the kindness of strangers. People who reach out to others in need, for no reward other than the satisfaction of helping others who are struggling. We have seen some examples of the best in people and it makes my heart glad. Thanks Jo for making my day. Thanks readers for reading. : ) Enjoy what comes your way this weekend. So, another one appears to have bitten the dust. Another Web 2.0 tool that is. Such is the ephemeral nature of the Web. Someone in Yahoo leaked a slide in December that indicated they intended to ‘sunset’ Delicious, along with other products such as ‘All the Web’, and ‘altavista’, two search engines they ran. ‘Sunset’, is Yahoo’s euphemism for ‘get rid of’. Interestingly, all the buzz has been about Delicious, the social bookmarking site they run. I remember regularly using ‘All the Web’, but admittedly, quite some time ago. I’m not surprised there has been so much outcry over the decision regarding Delicious; it’s a very popular site amongst people who understand that saving your bookmarks in a cloud based application is far more useful than storing them on your hard drive. Far more useful until they decide to ‘sunset’ it, that is. Plenty of people have already imported their bookmarks to other sites like Diigo and Pinboard. I’ve been using Diigo for some time, purely because I forgot the password I used to set up my Delicious account! I do like Diigo, but I found the interface of Delicious really easy for student use. I’ve actually spent quite a bit of time this year encouraging my students to use Delicious as a search tool. The user base of Delicious has been larger than that of Diigo and students have been able to see how many people have saved a site. I don’t need to speak to them at length why this is important; they’ve been able to articulate to me very easily that it means something to have a large number of people bookmark a site. It means that we have a human filter sorting out the Web for us, people determining sites that are of value. It’s this form of filtering that IS important, and something that is worth fighting for. My method meant that my users would get used to the subject headings I would appoint and thus would find it difficult to access other collections because my subject headings wouldn’t appear in other libraries. I suppose what I was doing was applying a folksonomy to a taxonomy or ontology before I’d even heard of the word! Even then, 20 or so years ago, I was struggling with a system that I felt was too rigid and not in touch with the search habits of the young people we were teaching. I always wanted to make the library relevant. I thought it would be a more accessible place if you were using the common speak of the time, rather than the structured language of a knowledge professional. I suppose that’s why I found tagging such an attractive option and social bookmarking made sense to me from the start. Delicious has been around for 7+ years now- that’s an awful lot of collective intelligence from savvy users of the Web sitting in one place. And that’s the reality too. Anyone who was using Delicious could be categorised as a savvy Web user I would think. It doesn’t have mainstream adoption. As I was sitting in a food court in December reeling a bit from Yahoo’s decision, I looked around me and considered that it was likely that not one other person sitting there probably had the slightest idea of what Delicious, or any other form of social bookmarking was. But that doesn’t mean that realisation isn’t going to take place as we all struggle with managing an elaborate web of millions of sites that deserve a sense of order. No knowledge professional can set about to provide a consistent set of rules to manage the Web, but the user base can, with the folksonomy of tags they apply to the sites they deem important. We’re actively thinking about the future of Delicious and we believe there is a home outside the company that would make more sense for the service and our users. We’re in the process of exploring a variety of options and talking to companies right now. And we’ll share our plans with you as soon as we can. That was posted on December 17th. No update as yet. Now we’re getting closer. While it is folly to assume either of these institutions could take over Delicious and keep it running as a viable service, it does seem like they would be interested in preserving the Delicious corpus and making it available for research. I love Delicious for many reasons, but chief among them is that it is the Internet’s memory storage device. In the 7+ years of its existence it has recorded the collective online journeys of millions of users during a time when the Web was evolving dramatically. Those memories are irreplaceable and have enormous value both to their owners (the users) and to society. It’s a great idea, but it does have to move beyond that. While there’s point to preserving the last 7+ years of collective intelligence stored in Delicious, it’s the potential it has for doing this in an ongoing capacity that is its true value. It seems somewhere along the way, the library profession has missed the boat. There SHOULD be a representative library body, a body that represents libraries worldwide, with the wherewithall to maintain a service like Delicious. Where’s the budding philanthropist, the Bill Gates or Steve Jobs, or Larry Page or Sergey Brin, who’ve made copious millions from the Web and know that it’s time to give back and ensure that the Web has the ability to make sense to those that use it. Perhaps someone like Robert Darnton, who has contributed to so much discussion about the future of the book and digitised libraries, could weigh in on the matter and lead action that would help create the Library of the future; the tagged web, a creation of the people who use it. The Web is ephemeral. Things come and go, just like businesses come and go, like television series come and go, like life really. In the past couple of weeks we’ve seen xtranormal begin to charge for their services, and DimDim be acquired by another company. Things change. Perhaps Jaron Lanier is right. Free as a model doesn’t work, and micropayments for services is the future of the Web if we want to see longevity with the applications we want to use. Where once I was the advocate of free, now I see a new way. A micropayment system, where we as users, along with the Venture Capitalists, fund the startups we find useful, and support them in their quest to monetise their services. If we don’t start to look at services on the Web differently, we risk losing more of the great products that help us aggregate web content, and we will all lose in the long run.